Chiropractic care can help with many types of sports related injuries. Many amateur and professional athletes use chiropractic treatment as part of their overall health care, fitness and maintenance program. 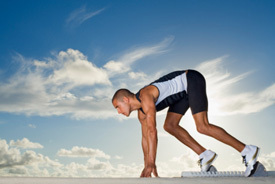 Chiropractic is often used to improve muscle and joint conditioning which has a direct effect on athletic performance. Treatment works to improve biomechanical function and enhance overall conditioning, important in situations where there is continuous repetitive movement. Chiropractic care also helps athletes fine-tune their muscles and joints for high-level performance and may reduce long term wear and tear. Finally, treatment can be used to prevent, and sometime shorten, the healing time of injuries.